Above: The saakhi of Sacha Sauda. Below, from bottom up - Guru Nanak in Mecca; Bhai Laalo and Malik Bhago; The Shade of the Cobra. Homepage image: Young Gobind Rai learns of His Father's martyrdom. Thumbnail: detail from Guru Nanak at Hardwar. All kinds ... from stories about the Guru's childhood and their travels, to the tales of courage and bravery of the Khalsa on the battlefield - there is nothing I loved more than to be transported to the era of my Gurus and the heroes of our faith. Whether it was at home, the Khalsa School, or Gurmat camp, I would take every opportunity I could to listen to a saakhi about Sikh history ... my history. I'd heard the story hundreds of times, but it was one my favourites, so I listened attentively. As he told us about the Guru's call to the crowd that day and finally one man standing and offering his head, he said that Guru Sahib then "brought him in to an enclosed tent and returned minutes later with a sword dripping in blood." Wait! ...What? Sword dripping in blood? Where did this come from? I immediately raised my hand, and the instructor explained that Guru Sahib had slaughtered a goat behind the tent. I never heard this before. Why would Guru Sahib need to fool the crowd in this way? Weren't they shocked enough that he was asking for a head in the first place? Why did this saakhi have to be unnecessarily embellished? I wondered how many other different "versions" of the saakhi were out there. Especially those that border the realm of logic ... the ones I was always amazed by. Did Baba Deep Singh really fight in battle with his head in his hand? In Mecca, did the Kaaba really move to the direction of Guru Nanak's feet? I remember a student asking me at Gurmat camp once why Guru Nanak stopped a boulder with his bare hand if the Gurus were averse to using "magical powers." Although I started to doubt many of the saakhis I grew up with, it did not shake my faith. In fact, what inspired me most of the Guru's lives were some of their worldly accomplishments - they were artists, poets, soldiers, human rights activists, environmentalists, city planners, architects, businessmen - all while living a productive family life. The fact that Guru Sahib took a stand against the caste system at age 9 by refusing to wear the Hindu janeeo ... this is what amazes me! The fact my Guru directly challenged oppressors like Babar during his brutal invasion and called him out as a tyrant ... this to me is the magic of Guru Nanak! Furthermore, some of these "super-hero" like saakhis that defy reality can be harmful too. Why would we want to make the Gurus larger than life and further distance ourselves from them? Maybe this is why people have resorted to babas and other intermediaries because we have made the Guru so "off-limits." After much thought on this, I stayed away from these "questionable" saakhis at camps and retreats and focused on those that were more logical or could be supported through bani. Many years have passed and as I've started telling saakhis to my own children, I find myself with a dilemma. Part of me wants to tell the same stories I was told as a kid, so I can see their eyes light up in enthusiasm and amazement, the same way mine did ... even if the stories are a bit exaggerated. Although I've decided to share only those saakhis that seem more realistic and practical, I still tend to "leave a little room." As I've discovered on my journey of Sikhi, the more I learn, the more I realize I don't know. The fact of the matter is, I wasn't there when Guru Sahib squeezed milk from Bhai Laalo's bread and blood from Malik Bhago's. I wasn't there when he stopped the boulder with his hand. I wasn't there when Guru Sahib asked that his feet be moved away from the direction of the Kaaba ... so perhaps I shouldn't let my parameters of logic restrict my understanding of history. Maybe through simran, further reflection, and learning ... my parameters will also change. We come from a rich and proud history. And as we individually connect with the events through our story-telling tradition, there is likely to be variation in the ways our stories are told. What is more important is that we are able to extract the central message - whether it is equality, truth, justice, or compassion. Because when a saakhi from our history is conveyed with enthusiasm, emotion, and love ... it is nothing short of magic! 1: Harinder (Bangalore, India), November 15, 2009, 1:21 PM. Miracles are a hall-mark of divinity and the saakhis of the Gurus are living proof of it. 2: Manpreet Singh (San Francisco, California, U.S.A.), November 15, 2009, 10:33 PM. I have a few questions. Let's take the saakhi of Baba Deep Singh. First, what is its authenticity ? Second, the Gurus themselves told us to stay away from miracles, so why did the miracle like Baba Deep Singh's Shaheedi happen, and why do we relate them so proudly? And finally, if a non-Sikh sees a picture of Baba Deep Singh's Shaheedi in my room, how can I satisfy his questions regarding this. Look forward to hearing from the readers here. 3: Jagjeet Singh (United Kingdom), November 16, 2009, 5:48 AM. Life itself is a miracle, and remembering that Guru Sahib was a puran Gursikh, he was able to do anything. When I learnt the truth about 1699, I was amazed too. The so-called 'educated' ones who hide the truth from these saakhis and because they are 'educated', they say Guru Nanak couldn't have walked on water, Guru Gobind Singh couldn't have brought the panj piaras back to life, Baba Deep Singh couldn't have fought on without his head - these people are the ones who are are deluded. A Sikh's aim in life is to jap naam and have a full vision of Waheguru in this lifetime. Now just imagine trying to explain that to the so-called 'educated' lot! 4: Gurjender Singh (Maryland, U.S.A.), November 16, 2009, 6:53 AM. Manpreet Singh ji, your question is right. I know some of the incident from Guru Nanak's life which are still evident today and you can see them without the aid of a history book, such as 1) Punja Sahib in Now Pakistan. As of today, there is no technology that exists which can create such an impression on any stone. 2) In Piliphit, Uttar Pradersh, India, there is a Retha tree (a poison fruit traditionally used to make soap and detergent). But the tree under which Guru Nanak sang gurbani bears sweet and edible fruit even today, five centuries later. Lots of scientists have studied this particular tree but could not come up with any explanation. There is always strength in gurbani and prayer. Sometimes it is indeed very hard to believe. How can one explain the martyrdom of the 7- and 9- year old children of Guru Gobind Singh, who were bricked alive by the Mughals. These a real examples of saakhis for generations to come and learn the power of gurbani. 5: Darshan Singh Abbott (Mumbai, India), November 16, 2009, 12:03 PM. There are no words which can explain the 'magic' of saakhis. 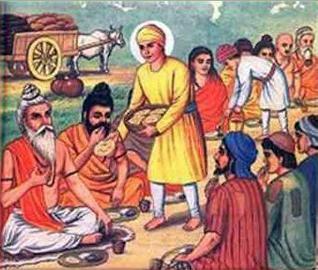 The more you read about Guru Nanak, the more you are bowled over by his life, especially during his Udasis (travels). A lake at 18,000 feet freezes during his visit to the Himalayas. The local villagers request Guru Nanak for help because they cannot get drinking water. The saakhi says Guru Nanak touched the frozen surface of the lake with a stick, and fresh drinking water was available for every body. To this date, the lake - despite its elevation and extreme weather - does not freeze and provides drinking water to thr people living in the area. A gurdwara now commemorates his visit: the Dongmar Gurdwara. 6: K. Singh (United Kingdom), November 17, 2009, 10:20 AM. 7: Parminder Singh (Chicago, Illinois, U.S.A.), November 17, 2009, 8:43 PM. "Miracles are a hall-mark of divinity". 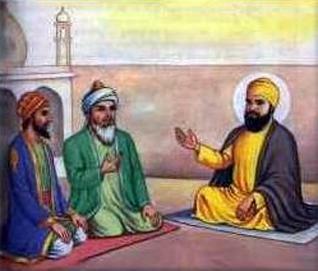 That is what Aurangzeb said to Guru Teg Bahadar, demanding that Guru Sahib perform a miracle to be considered a Pir. 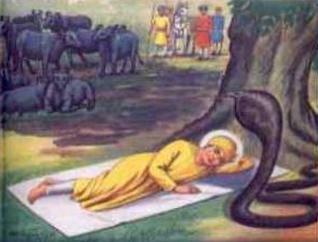 Guru Sahib refused - and was beheaded by the tyrant. 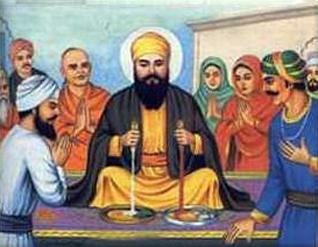 If Sikhs themselves judge the divinity of the Gurus based on "miracles", then how are we different from Aurangzeb? "Life itself is a miracle". Exactly. Manas Janam Dulambh Hai|| To view the whole creation as One, Ik Oankaar, is the ultimate miracle. But like many, I am just a believer in this miracle, I have not experienced it. Guru Sahib wants us to experience the miracle, not just be mere worshippers of Guru Sahib's ability to be one with the miracle which is Akaal Purakh. 8: Inderpal Singh (Montreal, Quebec, Canada), November 18, 2009, 2:09 PM. Our rich saakhis and gurbani can and indeed do go hand in hand. The true essence of any saakhi when told properly echoes gurbani's virtues, i.e. love for humanity, humility, striving to become a good person - i.e., god-like. The other details become irrelevant once the core of the story is understood. Ensure that this is what you relay to the next generation. Otherwise you will be lost and mislead others as well. Comment on "The Magic of Saakhis"